X-Ray Photoelectron Diffraction (XPD) is a powerful crystallographic technique that combines information on distinct and complementary aspects of the system under study, including its morphology, electronic structure and chemical composition. In a typical photoelectron diffraction experiment, a sample is illuminated by a photon beam, which induces the emission of electrons from the core levels of the surface atoms. The difference between the energy of the incoming beam and the kinetic energy of the ejected electron corresponds to the measured binding energy of the photoelectron. In XPD, this energy is monitored as a function of the photoelectron kinetic energy and emission angle. Along its path to the detector, the emitted electron can undergo a series of scattering processes from the atoms surrounding the emitting atom. This leads to interference between the direct and the coherently scattered components of the photoelectron signal. The resulting interference pattern is determined by the path-length differences and the scattering phase shifts between the electron waves. In this respect, XPD provides a direct structure determination tool and is best suited for applications on periodic surfaces, such as oriented single crystal surfaces, ordered adsorbate layers on crystalline substrates, or thin epitaxial films. Due to its high sensitivity to the surface structural details on the local scale, an XPD analysis can also be performed on systems lacking long-range periodicity, e.g., small atomic surface complexes and supported nanoclusters. 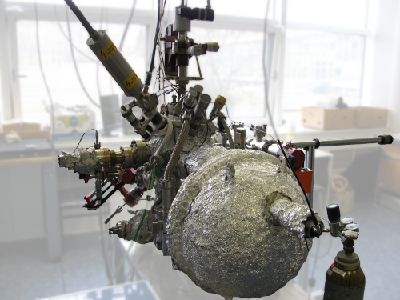 The system is built around an ultra-high vacuum (UHV) spherical experimental chamber pumped by a chain of a titanium sublimation pump, a turbomolecular pump and an oil-free scroll rotary pump. The chamber base pressure is in the 10-8 Pa range. A preparation chamber is connected to the experimental one and its base pressure is around 5×10-6 Pa. The instrument is equipped with photoemission spectroscopies and diffractions (XPS, XPD, UPS and ARUPS), ISS and LEED. Samples are usually prepared in situ. Electron beam stimulated evaporation sources are in place in the experimental chamber and reactive sputtering is in the preparation one. These techniques are combined with Argon ion surface cleaning and sample heating in the UHV, up to approximately 1000 °C. A gas injection manifold allows study of the samples’ adsorption properties. Samples must be electrically conducting and ultra-high vacuum compatible (stable, low vapor pressure) in the whole range of temperatures of the proposed experiment.